I’d had more than enough of being an itinerant preacher. For the past dozen years or so I’ve been free of Sunday pastoral responsibilities (I’ve had family responsibilities, of course), and so I’ve tracked round the place helping out friends who were on their own and needed a visitor to say the same things in a different voice. It’s been a great privilege, and enormous fun. I’ve loved seeing the gospel make progress around the country (despite the press myths). But my word, it can be tough work. You don’t know how to read reactions on people’s faces, let alone know their hearts. And you don’t know the battles they face. I felt I was conforming to that awful stereotype: blowing in, blowing up, and blowing out again. I felt I was conforming to that awful stereotype: blowing in, blowing up, and blowing out again. So I’d had enough, and I’ve been looking forward to returning to pastoring one set of people I know and love. That would be more than enough. Which I have done, and I’m in the right place. But I’ve been hit by the thought that of course I’ll never be able to know how to read the faces and plumb the hearts here, either. We are impenetrable to each other. But I also know that on any given Sunday, someone will have had the best week of their life, and someone the worst. Someone’s crumpled under their temptation, someone else is tortured by doubts, and a third needs to hear grace, grace, grace. On any given Sunday. Every given Sunday. So the only safe course is, once again to rely on the sufficiency of God’s Word – which is where I should have been all along as an itinerant as well. Yes, I’ll get to know people and shape my words in a particular way, but by and large I need to open God’s Word, and press it home to everyone in particular. Because God has known, and anticipated, each person’s needs, in general, and in particular, while scripture was being penned. God’s Word will do its wonderful and infinitely wise work. 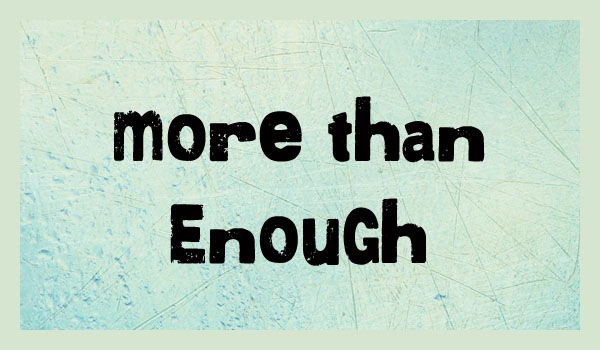 That’s more than enough.